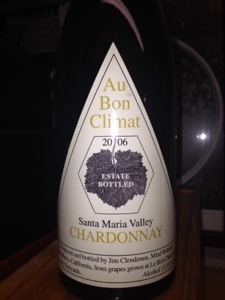 2006 Au Bon Climat Chardonnay Bien Nacido and Le Bon Climat Vineyards: Retail $40. I really loved this in the past, so I thought this was a natural choice for Chardonnay Day. It might have lost a step, but this is still fantastic. Lemon meringue on the nose–the kind that is golden brown on the top with a caramel nuttiness coming through. On the palate, quite viscous and creamy. Whoa. Yes, I said it might have lost a step, but it’s a baby-step, this is still lights-out. Outstanding. 91-93 Points. 2011 Axis Mundi Grenache/Syrah Windmill Vineyard: Retail $30. This is a very interesting wine. Very light in color, perhaps even lighter than a Pinot. On the nose, there is smoke, cherry, and a bit of blueberry. On the palate, this certainly is reminiscent of a Pinot, but with a slightly different flavor profile. The acidity is off the charts and thus, this wine screams for food. I really like this wine a lot and only wish that I had bought more. Very Good to Outstanding. 88-90 Points. 2001 Domaine du Colombier Hermitage: Retail $60. Ok. Whoa. I know I have thrown those out quite a bit lately. It might seem that I toss them about a bit willy-nilly. But that is not the case–this is rock-star status. Mocha, blackberry, and just a hint of green pepper. On the palate? That is where the Whoa comes in: rich, but not overly full or overbearing. Great acidity and some tannin on the backend with a finish that lasts close to three minutes (it could be more, but I get impatient). Outstanding Plus. 92-94 Points. 2002 L’Ecole No. 41 Cabernet Sauvignon Columbia Valley: Retail $40. Rich nose of mocha and some red fruit and the color belies the age–dark Crimson with no real sign of bricking (age). On the palate this is really wonderful. Great fruit predominates with nearly fully integrated tannins. Drink soon! Outstanding. 89-91 Points. 2012 Gruet Winery Grand Blanc de Noir Limited Release: Retail $33. A bit on the amber side, with a caramel note prominent on the nose. Austere on the palate with great flavors of brioche and a lemon creaminess on the finish. I love a good Blanc de Noirs and this is a good BdN. Likely better with food, but this was great paired with binge watching of Breaking Bad (yeah, I am not exactly a “trend-setter” when it comes to watching TV). Outstanding. 90-92 Points. 2007 Hugel et Fils Riesling “Hugel”: Retail $22. Under an agglomerated cork (Ugh). This is now the last bottle of this wine that I did not realize I had, and it is holding up well. A slight golden tinge in the glass hints at its age. On the palate, tons of lemon, a bit of minerality, and just a tiny suggestion of petrol. On the palate? Dry as a bone, with vibrant acidity and an admirable finish. Honestly, this might have scored higher if it had a “real” cork or, even better, a screw cap. Is that fair? Probably not, but I don’t like the crappy stopper cover up. Very Good. 88-90 Points. 2008 Skewis Pinot Noir North Coast Cuvee: Retail $45. I went searching for this bottle for some time. I finally realized that it had to be in a box under the stairs, behind a couple of bikes. I started digging, and digging, and digging. Of course it was in the very bottom of the box. Worth it. Bigger fruit than I would have predicted, with black cherry predominant. Big fruit on the palate as well, with good acidity, but maybe lacking just a bit on the back-end. Very Good to Outstanding. 89-91 Points. WINE OF THE WEEK: Every week, it seems, the selection of and the writing about the Wine of the Week presents some difficulties. Often, there are two or more wines that really stood out and it can be difficult to choose just one. Other times, there are a host of good wines, but none of them seem to rise above the others. This week, neither of those situations occurred. No, this week, the choice was fairly obvious and uncomplicated: the 2001 Domaine du Colombier Hermitage was magnificent. What made it even more worthy of remark was the fact that I had a bottle of it a couple of years ago and it did not show nearly this well. So what does that mean for my remaining two bottles? Should I pop them right away or hope for continued improvement? That is one of the great, yet maddening aspects of wine–you just never know. So what made this week particularly challenging (and why do I have the wrong photo)? Well, I am writing this in the Dallas/Fort Worth airport and I just realized that I do not have a photo of the Hermitage with me. So standing in for the French Syrah is a California Chardonnay, which makes absolutely no sense other than the 2006 Au Bon Climat Chardonnay Bien Nacido and Le Bon Climat Vineyards was Outstanding as well, and more importantly, I have a picture of it on my laptop. This entry was posted in Cabernet Sauvignon, Champagne, Chardonnay, Pinot Noir, Riesling, Sparkling Wine, Syrah, Wine and tagged Argyle Pinot Noir, Argyle Pinot Noir Nuthouse, berry fruit, California wine, cellar tracker, Chardonnay, Pinot Noir, Skewis Pinot Noir Anderson. Bookmark the permalink. Anything from Au Bon Climat — they make insanely great wines! Great line up this week. Thanks. And yes, if it is from Au Bon Climat, I am pretty sure I am going to like it…. Love ABC. Also like the Axis Mundi ’11 Grenache/Syrah. The Hermitage does sound incredible. And I am sorry you were writing from which airport??? HELLO!!! I only had a couple hour layover there, had it been more I would have called! You better! I have a car you know! Might be there a lot more often….